Pictured is the Delaware County Sheriff’s Office Administrative Offices building on North Sandusky Street. The DCSO reports that scammers will call people, pose as a deputy and tell them they have a warrant out for their arrest before directing victims to purchase prepaid Visa cards or iTunes gift cards to make the warrant go away. The scammer will order their victim to drop the cards off at the administrative office building on Sandusky but will then call at the last minute and take the card numbers over the phone. The Delaware County Sheriff’s Office is warning residents of a phone scam being perpetrated by individuals claiming to be sheriff’s deputies. 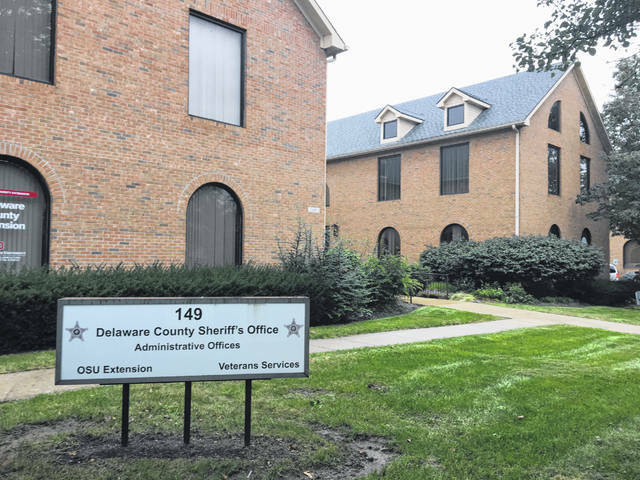 Delaware County Sheriff’s Office Detective Jeff Bessinger said Wednesday that there has been a string of recent scam phone calls that have already cost some Delaware County residents tens of thousands of dollars. Bessinger said a man calling himself “Deputy Walker” will call residents and scare them into thinking they will go to jail unless they give him money over the phone. Bessinger added the caller will direct victims to go to stores and buy prepaid Visa cards or iTunes gift cards. Bessinger said the scammer has also convinced a man to send $1,000, and he added the sheriff’s office has taken reports of more than a dozen other attempts. Bessinger said summons or other communications from the sheriff’s office will typically come via certified mail. Bessinger added he’s requested information about the phone number but believes that the caller used a prepaid “burner” phone. “A lot of times these people aren’t even local, that’s why they don’t want to meet,” Bessinger said. He added on Monday, the scammer targeted local teachers and targeted medical professionals later in the week. Bessinger said if you think you are on a scam call from a person claiming to be a law enforcement officer, hang up and call that office’s direct line. City of Delaware Police Captain Adam Moore said Thursday that similar calls happened sometime ago with a scammer posing as someone from the non-existent “Delaware County Police Department” who demanded money to prevent an arrest. Moore said the police department isn’t even set up to take money over the phone and would tell people to turn themselves in if they knew they had an active arrest warrant. The sheriff’s office is asking residents who have spoken with this individual to please contact detectives and share any information. Bessinger can be reached at jbessinger@co.delaware.oh.us or 740-833-2892.
https://www.delgazette.com/wp-content/uploads/sites/40/2018/09/web1_IMG_5690.jpgPictured is the Delaware County Sheriff’s Office Administrative Offices building on North Sandusky Street. The DCSO reports that scammers will call people, pose as a deputy and tell them they have a warrant out for their arrest before directing victims to purchase prepaid Visa cards or iTunes gift cards to make the warrant go away. The scammer will order their victim to drop the cards off at the administrative office building on Sandusky but will then call at the last minute and take the card numbers over the phone.